Paul Nehlen (born May 9, 1969) is an American white supremacist, neo-Nazi and political candidate who ran in the Republican primary for U.S. Representative from Wisconsin's 1st congressional district in 2016 and 2018. He was unsuccessful during both attempts at running for the office, losing to incumbent Representative Paul Ryan in 2016 and Representative-elect Bryan Steil in 2018. An April 2018 article from The Daily Beast declared that Nehlen was becoming one of the highest profile white nationalists in America. Nehlen was born in Ohio, and has lived in Delavan, Wisconsin since 2014. His business career has included stints at Deltech Engineering / United Dominion Industries and SPX Corporation, and he served until 2016 as the Senior VP of Operations at Neptune-Benson LLC. a subsidiary of Evoqua Water Technologies. He holds several patents related to filtering and manufacturing methods, and registered in 2014 a consulting entity, Blue Skies Global LLC, which does not appear to have conducted any business to date. 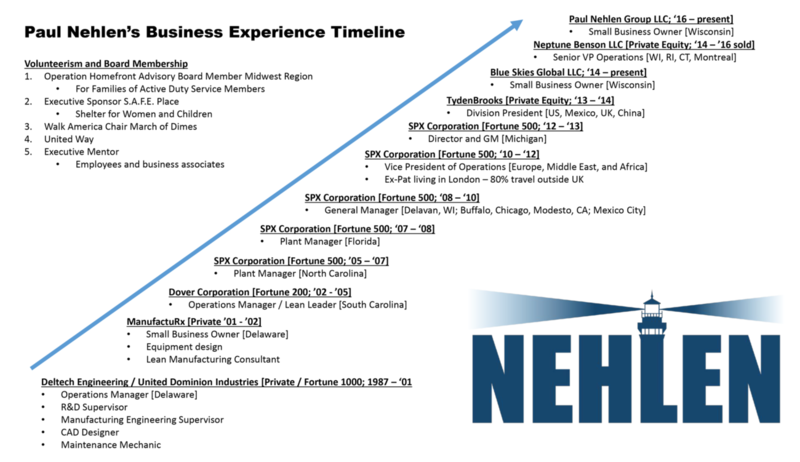 Nehlen was a Midwest Region advisory board member of Operation Homefront until 2016, and is married to Gabriela Lira. They have no children of their own, but Nehlen has two grown sons from a prior marriage. Nehlen holds alt-right, white nationalist, and antisemitic views. He has used white nationalist memes to spread his message. He was originally backed by Steve Bannon. Nehlen endorsed Republican Roy Moore in the 2017 Alabama U.S. Senate special election. On December 14, 2017, Nehlen's campaign released a statement calling for a federal law banning large social media companies from censoring or restricting "lawful speech" on their platforms. Nehlen's proposed bill includes fines of $500,000 for each violation. Supporters of Nehlen have used the hashtag #ShallNotCensor online to show their support for this position. Limitations to "lawful speech" would include "No publishing any individual's nonpublic residential address, telephone number, or email address without their consent". However, Nehlen's campaign has posted private phone and email addresses without their consent on the website and then tweeted a link to them. Nehlen frequently uses the slogan: "It's OK to be white." On Twitter, he suggested Ari Cohn convert to Christianity to "fill a Jesus-shaped hole" inside of him. Paul Nehlen said he was reading The Culture of Critique (1998) by Kevin B. MacDonald and described it as "outstanding so far". He called John Cardillo and Kurt Schlichter "shekels-for-hire" and posted a tweet with the antisemitic catchphrase "The goyim know" (referencing a popular theory about an alleged Jewish conspiracy). In a text message he sent to The Washington Post Nehlen claimed, "I reject being called a White Supremacist, because clearly Pro-White isn't White Supremacy unless Pro-Jewish is Jewish Supremacy." Nehlen also posted on Twitter a picture of Paul Ryan and Randy Bryce being dropped out of a helicopter, a reference to death flights, a method of executing political opponents. Responses to this message included death flight memes of former Chilean president Augusto Pinochet (whose regime killed more than 100 people by this method) and Pepe the Frog. On February 9, 2018, in response to claims that prehistoric Britons probably had dark skin, Nehlen tweeted a picture of Prince Harry with a reconstruction of a prehistoric dark-skinned Briton superimposed over his biracial fiance Meghan Markle, with the words "Honey, does this tie make my face look pale?" Nehlen was subsequently suspended from Twitter, which Nehlen described as a violation of his free speech. In late February 2018, he was a guest on former Ku Klux Klan leader David Duke's radio show, and stated that Trump's proposed border wall should include automatic turrets. Nehlen stated that any Mexican immigrant who approaches the American border should "be treated as an enemy combatant. Man, woman or child." He is also a critic of the presidency of Donald Trump, calling him a "cuck" and a failure. In February 2018, after a series of racist and anti-Semitic tweets, he was permanently suspended, or banned from Twitter. The Republican Party of Wisconsin has cut off ties with Nehlen, saying that his "ideas have no place in the Republican Party". In April 2018, Nelhen allegedly doxed alt-right people that he saw as too moderate, willing to compromise, or unwilling to take militant street action. Gab, which is considered by some to be an alt-right version of Twitter, banned Nehlen for doxing a troll who went by the name Ricky Vaughn. After doxxing the troll, who gained notoriety by posting popular racist and antisemitic memes, Nehlen claimed that the troll's real name is Douglass Mackey. He received endorsements from Breitbart News and people such as Laura Ingraham and Sarah Palin for his run in the 2016 Wisconsin's 1st congressional district primaries. He was defeated, getting 16% of the votes versus Paul Ryan with 84% of the votes. When he posted a ballot selfie on election day, the Town of Delavan police said he had committed election fraud, a Class I felony. The police said he deliberately delayed an investigation by doing a factory reset on the phone and erasing the SIM card. Assistant District Attorney Haley Johnson said the ballot selfie was "technically a violation" of law, but decided not to issue criminal charges, stating Nehlen had "ignorantly posted the image to draw attention to his candidacy," and not vote buying. Johnson wrote "It is unfortunate that Mr. Nehlen showed such little regard for a law enforcement investigation." Nehlen ran again in 2018 to replace Paul Ryan, this time with Nick Polce also in the race for the 2018 Republican primary. He was backed by Steve Bannon up until the Roy Moore defeat, now being denounced by Breitbart. On December 27, 2017, Bannon's adviser Arthur Schwartz said Nehlen is "dead to us" and "Bannon cut all ties with him and tossed him to the curb." Breitbart senior editor Joel Pollak said: "We don't support him." On December 27, Pollak tweeted that Breitbart had not covered Nehlen in months. However, as recently as December 18, he had been a featured guest on Curt Schilling's Breitbart radio show Whatever It Takes; Schilling unequivocally expressed his endorsement of Nehlen. Callum Borchers of The Washington Post said "Breitbart's move is political calculus" because it "needs to align itself with politicians who can win to help regain the appearance of influence Moore's defeat damaged." On February 13, 2018, Wisconsin GOP spokesman Alec Zimmerman said, "Nehlen and his ideas have no place in the Republican Party." Wisconsin Assembly Speaker Robin Vos said, "It looks to me like he's a racist bigot." Ryan's campaign spokesman Kevin Seifert said, "It has long been clear that Paul Nehlen holds bigoted views." Nehlen responded with, "I am a member of the Republican Party regardless of what their traitorous, spineless apparatchiks believe," adding his agenda should "be the centerpiece of the Republican Party." ^ "Paul Nehlen's Biography - The Voter's Self Defense System". Vote Smart. Retrieved 2018-05-01. ^ "Jewish Republicans 'very confident' white supremacist won't replace Paul Ryan". The Times of Israel. JTA. 12 April 2018. Retrieved 2018-04-12. ^ a b Oppenheim, Maya (13 February 2018). "Republican candidate banned from twitter for racist Meghan Markle tweet". The Independent. ^ Hayden, Michael Edison (2018-04-11). "Will Paul Ryan be replaced by a white supremacist in Wisconsin?". Newsweek. Retrieved 2018-04-12. ^ a b Stack, Liam (11 April 2018). "Paul Ryan Is Leaving. Who's Running for His Seat?". The New York Times. ^ "Paul Nehlen: Nazi Ideology on the Republican Ticket". Medium. April 11, 2018. Retrieved August 19, 2018. ^ Shepherd, Jake (August 15, 2018). "More Than 6,600 Wisconsin Republicans Voted for a Neo-Nazi in Last Night's Primary". Gritpost. Retrieved August 19, 2018. ^ Coaston, Jane (July 9, 2018). "Self-described Nazis and white supremacists are running as Republicans across the country. The GOP is terrified". Vox. Retrieved August 19, 2018. ^ "US politician Paul Nehlen's racist tweets at Meghan Markle see his account permanently suspended by Twitter". Firstpost. February 13, 2018. Retrieved August 19, 2018. ^ Rubin, Nathan (December 28, 2017). "Roy Moore lost. But there are already more like him". Millennial Politics. Retrieved August 19, 2018. ^ a b Markay, Lachlan (April 11, 2018). "Paul Ryan's Retirement Gives a Big Boost to the Most Prominent White Nationalist in U.S. Politics". The Daily Beast. Retrieved April 17, 2018. ^ Moghe, Sonia (April 12, 2018). "Meet 'Iron Stache,' the Democrat running to replace Paul Ryan in Wisconsin". CNN. ^ Parsons, Andy (August 9, 2016). "Paul Ryan Wins Republican Primary in Wisconsin". The New York Times. Retrieved November 11, 2018. ^ "Wisconsin Primary Election Results: First House District". The New York Times. August 16, 2018. Retrieved November 11, 2018. ^ Miller, S.A. (March 29, 2016). "Businessman Paul Nehlen to challenge Paul Ryan from right in primary - Says he's 'had it' with House speaker betraying conservatives". Washington Times. Archived from the original on June 4, 2017. Retrieved January 6, 2018. ^ "Paul Nehlen's Business Timeline". Nehlen For Congress. Archived from the original on December 27, 2017. Retrieved January 6, 2018. ^ "Patents by Inventor Paul F. Nehlen, III". Justia. Archived from the original on December 8, 2017. Retrieved January 6, 2018. ^ O'Donnell, Dan (March 7, 2017). "Is Paul Ryan's Primary Opponent Really a Small Business Owner?". News/Talk 1130 WISN. Archived from the original on September 25, 2017. Retrieved January 6, 2018. ^ Zambo, Kristin (April 10, 2016). "Delavan businessman hopes to unseat Ryan". The Journal Times. ^ O'Reilly, Andrew (2018-07-20). "Nazis and anti-Semites slip through GOP primaries, causing headaches for party". Fox News. Retrieved 2018-08-11. ^ Hayden, Michael Edison (2017-12-20). "A Republican candidate for Congress has openly embraced neo-Nazi meme culture". Newsweek. Archived from the original on 2017-12-26. Retrieved 2017-12-26. ^ a b Guttman, Nathan (2017-12-26). "Paul Nehlen, Paul Ryan's 'Alt-Right' Opponent, Goes On 'Shekel-For-Hire' Rant". The Forward. Archived from the original on 2017-12-27. Retrieved 2017-12-26. ^ a b Brigham, Bob (2017-12-20). "Bannon-backed candidate advocates murdering Paul Ryan with a fascist 'death flight'". RawStory. Archived from the original on 2017-12-27. Retrieved 2017-12-26. ^ Green, Emma (2018-01-24). "Paul Nehlen Is an Anti-Semitic Clown". The Atlantic. ^ Strickland, Patrick (2018-02-09). "Alarm Over White Supremacist Candidates". Al Jazeera. Asked by Duke if it was wrong to support the preservation of a white-majority country, Nehlen replied that it was "right and righteous" to do so. ^ a b Kuper, Theodore (2017-11-17). "Steve Bannon Candidates Fail". National Review. Archived from the original on 2017-11-25. ^ a b c d e Sommer, Allison Kaplan (2017-12-20). "Meet the White Nationalist Who Wants to Replace House Speaker Paul Ryan". Haaretz. Archived from the original on 2018-01-02. ^ a b Mathias, Christopher. "A Republican Running To Replace Paul Ryan Comes With White Nationalist Street Cred". Huffington Post. Archived from the original on 2017-12-28. ^ Kumar, Anugrah. "Alleged White Nationalist Tied to President Trump and Roy Moore Challenging Paul Ryan". The Christian Post. Archived from the original on 2017-12-27. ^ "#ShallNotCensor - Paul Nehlen for Congress". www.electnehlen.com. Retrieved 2018-02-12. ^ Mason, Kyla Calvert (2018-01-31). "Paul Nehlen Posts List of Critics, Says '74 are Jews'". Wisconsin Public Radio. Retrieved 2018-02-12. ^ Stein, Jason (2018-01-31). "Paul Ryan challenger posts phone numbers of critics after claiming '74 are Jews'". USA Today. Retrieved 2018-02-12. ^ Paul Nehlen [@pnehlen] (19 Dec 2017). "See, now we're getting somewhere @AriCohn. You can't fill a Jesus shaped hole in your heart by trolling the internet, calling people names" (Tweet). Archived from the original on 23 January 2018. Retrieved 23 January 2018 – via Twitter. ^ Hayden, Michael Edison (2017-12-27). "Neo-Nazis celebrated Republican Paul Nehlen's endorsement of an anti-Semitic book". Newsweek. Archived from the original on 2018-01-13. Retrieved 2018-01-23. ^ Paul Nehlen [@pnehlen] (2017-12-26). "Currently reading pic.twitter.com/8UVUeEn7PC" (Tweet). Archived from the original on 2018-01-05. Retrieved 2018-01-23 – via Twitter. ^ Paul Nehlen [@pnehlen] (4 Jan 2018). "As you know, I'm currently reading The Culture of Critique, which is outstanding so far. Newsweek recetly [sic] published a grotesque smear piece on the book. Here is the response to that piece by the book's author, Professor Kevin MacDonald. …" (Tweet). Archived from the original on 2018-01-04. Retrieved 2018-01-23 – via Twitter. ^ Weigel, David (December 27, 2017). "Ryan's 'pro-white' primary foe denounced by Breitbart after his anti-Semitic tweets". The Washington Post. ISSN 0190-8286. Retrieved April 11, 2018. ^ Franklin, Jonathan (9 January 2001). "Chilean army admits 120 thrown into sea". The Guardian. ^ Morton, Victor (11 February 2018). "Paul Nehlen Twitter account suspended". washingtontimes.com. ^ a b Hayden, Michael Edison (March 14, 2018). "The alt-right's first candidate is too right for many white nationalists". Newsweek. Retrieved April 5, 2018. ^ Sommer, Allison Kaplan (30 January 2018). "Meet Paul Nehlen, the Hate-baiting Republican Trying to Unseat Paul Ryan". Haaretz. ^ a b Phillips, Kristine (13 February 2018). "GOP politician from Wisconsin banned from Twitter for photoshopped Meghan Markle tweet". Chicago Tribune. ^ Sullivan, Emily (13 February 2018). "Twitter Bans GOP Contender For Racist Tweet Targeting Meghan Markle". National Public Radio. ^ Scott, Bauer (2018-02-13). "Republicans Distance Themselves From Ryan Foe Paul Nehlen". Associated Press. ^ a b Sommerhauser, Mark (2018-02-14). "State GOP: 'No place in the Republican Party' for Wisconsin congressional candidate banned by Twitter". Wisconsin State Journal. Retrieved 2018-02-16. ^ "In another major stumble for the alt-right, pundit "Ricky Vaughn" allegedly doxed by Paul Nehlen". Southern Poverty Law Center. 2018-04-03. Retrieved 2018-04-05. ^ Pink, Aiden (April 5, 2018). "Even The Alt-Right Is Sick Of Paul Nehlen". FastForward. ^ "Paul Nehlen and Breitbart's Shameless Opportunism". National Review. 2018-01-05. Archived from the original on 2018-01-06. Retrieved 2018-01-12. ^ "Paul Nehlen". Ballotpedia. Archived from the original on 2017-05-04. ^ "Police: Republican Paul Nehlen deliberately delayed investigation into ballot selfie". FOX6Now.com. 2017-07-11. Archived from the original on 2018-01-01. Retrieved 2017-12-31. ^ "POLCE, NICK - Candidate overview - FEC.gov". FEC.gov. Archived from the original on 2017-12-27. ^ "Paul Nehlen and Breitbart's Shameless Opportunism". 21 December 2017. Archived from the original on 27 December 2017. ^ Darcy, Oliver. "Bannon adviser: Paul Ryan challenger Paul Nehlen is 'dead to us' after inflammatory tweets". Archived from the original on 2017-12-27. ^ "Breitbart cuts ties with Paul Ryan rival Paul Nehlen over anti-Semitic rhetoric". Haaretz. JTA. December 27, 2017. Retrieved November 7, 2018. ^ Legum, Judd (December 28, 2017). "Breitbart quietly deletes recent interview with openly racist congressional candidate". ThinkProgress. Archived from the original on 29 December 2017. Retrieved 29 December 2017. ^ Borchers, Callum (2017-12-28). "Analysis | The real reason Breitbart abandoned 'pro-white' Paul Nehlen". Washington Post. ISSN 0190-8286. Archived from the original on 2018-01-01. Retrieved 2017-12-31. ^ "Wisconsin Elections Commission". Wisconsin Elections Commission. August 9, 2016. Archived from the original on December 3, 2016. Retrieved December 2, 2016. ^ "Paul Ryan Is Leaving. Who's Running for His Seat?". The New York Times. April 11, 2018. ^ These are candidates who have announced the intention to run; nominating papers must be filed by June 1, 2018. The Republican primaries will be held on August 14, 2018, followed by the general election on November 6, 2018.